A spokesperson said, “Tori Lanae Cariah is a 20-year-old junior at Georgia State University, where she is majoring in Middle and Secondary Education with a concentration in English and Social Studies. 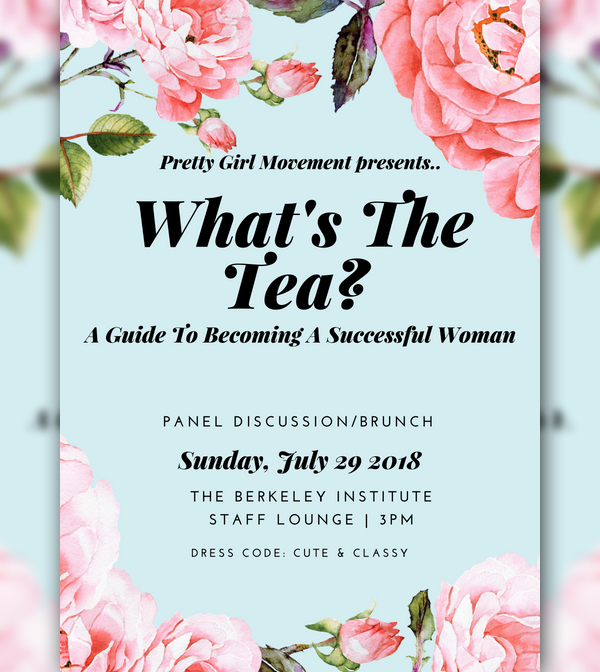 “Pretty Girl Movement was originally started as a women’s blog on Instagram. The blog featured posts such as ‘A Thread to Self Confidence,’ ‘Women Crush of the Week,’ ‘Fashion Look-Books,’ and other various motivational posts regarding self-worth, respect towards other women, and standing out in a crowd. “This is when she decided to create the event ‘What’s The Tea? : A Guide To Becoming a Successful Woman,’ a spin on the Bermudian gossip culture transformed into a more positive light. This event features influential women from new to older generations. The panel consists of women that have been influential in various ways in their community or overseas. “Panelists include Nia Dailey [Spelman College student, Rotary Exchange 2016-2017]; Chelsea Warren [CEO of Uptimum Bodied]; Patrina O’Connor Paynter [award winning media personality and community activist]; Tanaya Tucker [Crown Counsel]; Olivia Hamilton [music artist]; Rael Simons [owner of iman artistry]; and Garita Coddington [principal of T.N.Tatem Middle School].